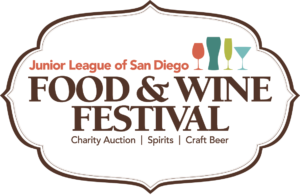 The Junior League of San Diego’s annual Food and Wine Festival is JLSD’s biggest fundraising event of the year and is a must-attend event for San Diego. All funds raised at the 2019 Food and Wine Festival support our mission-based community projects and JLSD’s commitment to training women to be leaders in our community. The festival features some of San Diego’s best restaurants, breweries, wineries, and distilleries offering unlimited tastings to showcase their delicious offerings. Bring your friends and enjoy the beautiful views at La Jolla Cove as you listen to live music and support a good cause. You will also have the opportunity to bid on great silent auction items donated by generous area businesses. The event starts at 2:00 p.m., but VIP admission will gain you entry one hour early to the festival and special VIP-only tastings. VIP tables for 10 also include reserved seating at a table with an umbrella and valet parking. Dress code is anything goes! But it’s more fun to dress up in your Sunday best and add a fun hat or fascinator. Be aware that you will be walking on grass, so ladies, you may want to skip the heels and wear wedges or flats instead. Don’t forget to wear sunscreen! Parking may be difficult at La Jolla Cove, so be sure to carpool with a designated driver or take Uber or Lyft! All tickets are non-refundable as we will proceed with the event rain or shine! Please bring your ID as this is a 21 and up event and all attendees must show a valid ID.